BOTTOM LINE: A fiery new musical that takes a modern approach to the telling of a fairy tale, using the themes of acceptance and pleasing ourselves over others. Going against the grain is not normally fun, and rarely easy, but it is often necessary for our happiness. The characters of Scorched learn this lesson early on, that just because something has been done a certain way in the past, does not mean that it is right for all subsequent situations. Storybooks benefit the kingdoms, not the individual princes and princesses who are expected to marry without loving each other. However, they must do so to unite against the world's evils: dragons, witches, monsters, etc. Such is the case with Prince Edward (Sam Bolen) and Princess Alanna (Lindsay Garber) who will be married, to join the Kingdom of the East and the Kingdom of the West. Neither seems happy, but Alanna seeks the approval of her father King Robert (Brian Demar Jones), and Edward always wants to please his mother Queen Agatha (Jenelle Chu). Alanna's Lady in Waiting, the perfect Margaret (Kristian Espiritu), is also no stranger to pleasing others. With a wedding, royal abduction by a dragon, a haunted forest, and love in the mix, everyone involved needs to determine if they want to please others or themselves. Facing their fears puts each of these characters in danger, forcing them to decide who and what is most important to their safety and happiness. Scorched accomplishes an impressive feat. It provides a stage for over thirty designers and performers, many from Yale University, to debut their work in New York City. As part of The Araca Project, these talented individuals are still clearly at the beginning of their careers, showing off what they can do in this new production, but I have confidence that we will see many of them again in Broadway theatres and on the big screen, and hear about their work across many platforms. Live music is not guaranteed in many productions these days. Hearing the musicians interact with the performers was such a wonderful interplay. The notes from both melted together beautifully. This added a special element to the show, connecting with the audience more organically. Though most of the cast and crew involved with Scorched is talented, one actor stood out from the rest as a comedic delight. Christine Octavia Shaw, an incredibly talented woman who plays Barnie (one half of the two-headed dragon), is someone I would love to see perform again. She has personality, timing, and that je ne sais quoi. Of course, every comedian needs a straight man, so her other half, Baz, played by Connor Lounsbury, also deserves credit. They really stole the show. 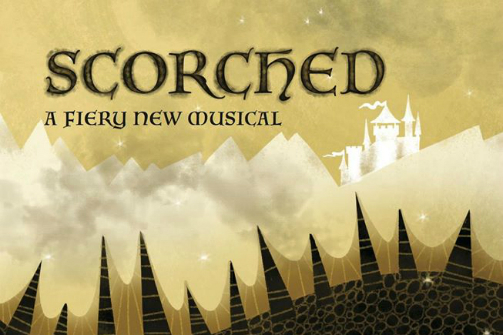 Scorched is created by Benji Goldsmith, Molly Houlahan, and Yuvika Tolani. Book/Lyrics by Molly Houlahan. Music/Lyrics by Benji Goldsmith. Directed by Molly Houlahan. Produced by Chris Homburger, Henry Tisch, Yuvika Tolani, and Angeline Wang. Choreography is by Christine Octavia Shaw. Production Design is by Marisa Kaugars. Lighting Design is by Hillary Luong. Sound Design is by Ian Wehrle. Music Direction is by Ian Miller. Orchestrations are by Tim Laciano. Stage Manager is Tzipora Reman. The cast is Sam Bolen, Mary Bolt, Jenelle Chu, Nathaniel Dolquist, Zina Ellis, Kristian Espiritu, Lindsay Garber, Paul Hinkes, Brian Demar Jones, Connor Lounsbury, Christine Octavia Shaw, Stephanie Rocio, Chandler Rosenthal, and Thomas Stilwell. The orchestra is Kaci Cummings, Spencer Lutvak, Ian Miller, John O'Leary, Jessica Wange, and Samuel Zerna.